There hasn't been much news to report since the anime update earlier this week. The Date Matsuri event has ended over at e-Capcom, and in its place they're now running a Takeda Matsuri instead to highlight products featuring Yukimura, Sasuke and Shingen. There's also going to be a new weekly broadcast called Capcom TV starting next Wednesday at 20:00 (Japan time). It's described as being a live show which features information about all Capcom games, so it wouldn't be unthinkable for them to use it to promote the anime. Since it's the last opportunity for traditional Sengoku Basara: Judge End coverage before the anime begins airing next month, I splashed out and bought four different anime magazines. All of them were released together on 10th June 2014 so they arrived in a satisfyingly hefty box. First of all, Animage and Newtype were big disappointments with no exclusive coverage at all - you would have had to look hard to even notice their tiny news bulletins announcing the latest details. It's a good thing they both contained content about other series I like. Since the more mainstream magazines weren't devoting any serious time to Judge End, I switched my focus to the female-orientated books. Things picked up with PASH! where there was a proper article announcing the six newest additions to the anime's cast (Kojuurou, Sasuke, Shingen, Yoshitsugu, Hideyoshi and Hanbee). The promised fold-out poster was also included. Since they tweeted a picture of it themselves I'm going to assume it's fine to post a small photograph here. I really like the illustration they used. 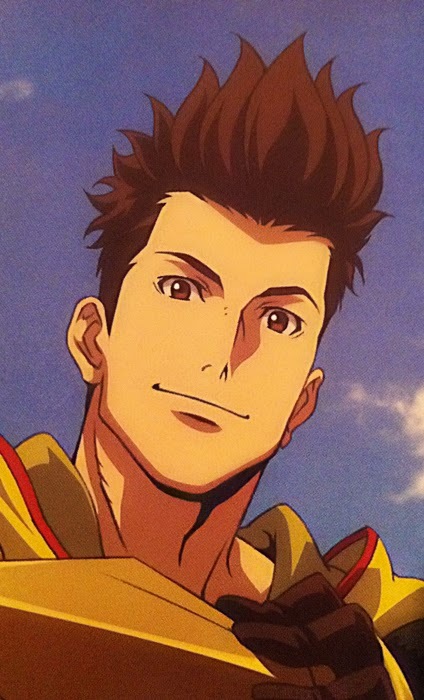 Since Ieyasu doesn't appear anywhere else in the magazines I took a little picture of him on his own. 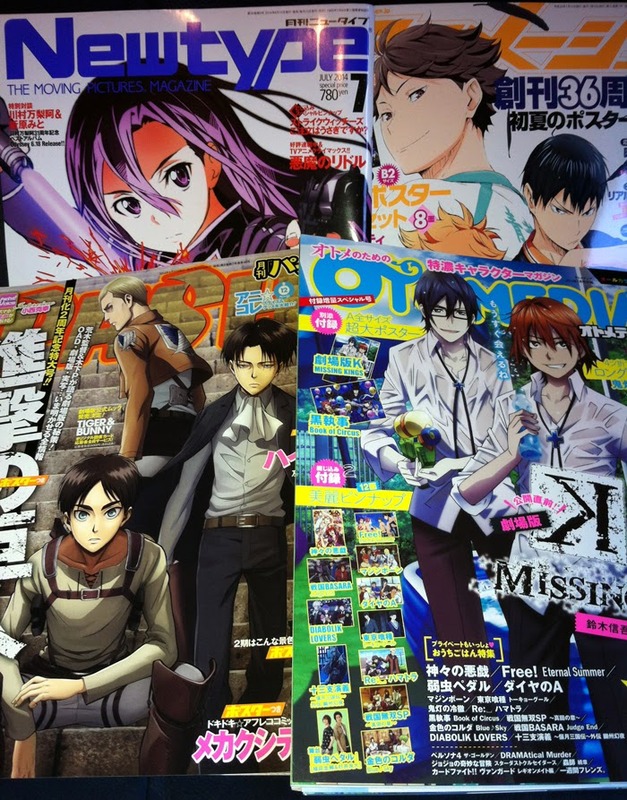 The last of the four magazines was Otomedia+ which swapped the blue skies for a rainy scene. A pull-out poster was included at the back of the magazine with a textless version of the same image. The story of Ieyasu and Mitsunari is the main plot this time, but they're also creating a drama with the series' iconic leads Masamune and Yukimura to keep it accessible for casual viewers and fans of the previous anime. The series will primarily focus on the four leads from beginning to end. It will tell the full story from the fall of the Toyotomi to the Battle of Sekigahara. The depiction of the Battle of Sekigahara isn't going to be the same as it was in the movie. 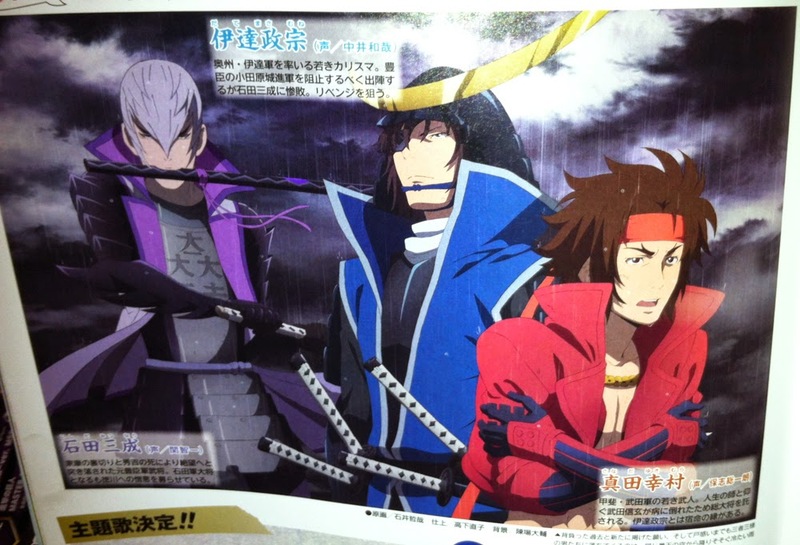 They have included content that wasn't in the original Sengoku Basara 3 game. KobaP hopes that the fans will notice the differences! Ieyasu's role is particularly important this time. While there will naturally be drama stemming from the 'azure-crimson' relationship between Masamune and Yukimura and the ex-Toyotomi link between Ieyasu and Mitsunari, the axes formed by Masamune/Mitsunari and Yukimura/Ieyasu will cross somewhere too. In response to a question about which characters people should look out for besides the four main characters, KobaP simply answered that people such as Kojuurou, Hanbee, Sasuke and Shingen from the Date, Takeda and Toyotomi armies would all be appearing. I guess he won't be drawn into revealing anything new until the time is right. 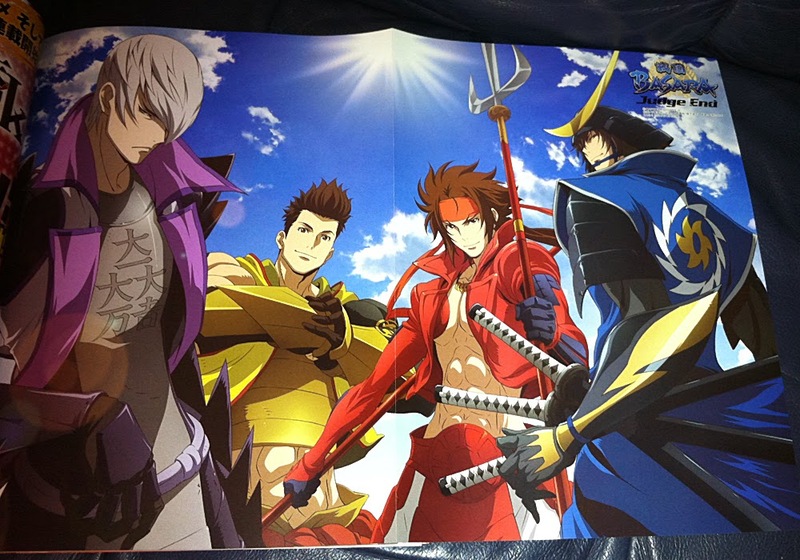 Since the story draws closely from Sengoku Basara 3, fans who become interested in what they see in the anime can still go back and enjoy playing the game. Speculating further on what he says, it sounds as though they might avoid using the Oda storyline (as in Sengoku Basara -The Last Party-) as the climax this time around. The interview ended with a lighthearted column where KobaP shared his knowledge about how the four leads might spend a rainy day. Date Masamune: My image is of Masamune looking at the mountains of Oushuu from the passageway (engawa) of his residence as Kojuurou worriedly checks the state of his vegetable garden. Sanada Yukimura: Since Yukimura-kun isn't the kind of person who can keep still, I get the feeling that he'd be happy to go outside and train his body. Ishida Mitsunari: If it was back when Hideyoshi was alive, he could train indoors. Or he might stay beside Hideyoshi and Hanbee and listen to their discussions. Perhaps there will be better coverage in July because it feels as though the series need a lot more promotion! Hopefully there'll be something in Dengeki Maoh and the weekly magazines as the anime's debut approaches. Well, it's not known either way yet so it was just my personal interpretation of the comments. But I think that if they have to make some room to develop the main Sekigahara plot from beginning to end the way they're planning, saving the Nobunaga storyline for an OAV or sequel might be better (he's also guaranteed to be in any Sengoku Basara 4 projects since he's necessary for Katsuie's story to make sense). I'm still not happy about the decision to bring the drama. I know it's subjective, but, eh. I hope they'll at least include funny extras or at least a fun OP/ED that's not just about the characters angsting. And I hope they won't cut Tadakatsu! Now that Ishikawa's song has been confirmed as the ED I guess it rules out a playful Sourin song and dance routine. Funny extras would definitely be very welcome though - with bonus points if Sunday makes his anime debut as a joke in a next episode preview. Ieyasu without Tadakatsu would just be strange. He'd have to walk/ride everywhere! Nice pics even if the proportions are weird. But, we still don't know what the actual anime will look like. Not even a little teaser trailer...this is suspicious! Will the anime really start in July, or is just a first episode and the rest will be aired later...? I don't think that Yukimura is angsting but simply regretting his lack of shirt in that cold, rainy picture...although Masamune's presence surely should inspire some BURNING SOUL. Yukimura: *sneezes* Masamune-dono, I deeply regret agreeing to do this photoshoot. Masamune: Shut up and pose, it's almost over. Anyway, I don't think the anime will start later than its projected starting date, if that was the case I think we would know that already. But it is a bit worrying that there's nothing so far, there could very well be production issues... I hope not, though. I'm hoping that tomorrow's Capcom TV show will provide a good opportunity for them to launch some kind of PV but I won't be able to watch at broadcast time due to work. I want to see the new designs moving/speaking and hear some of the mysterious new music soon! Oh, they've just released a new English-language press release so it's 100% confirmed to be a weekly series. I sure hope the Japanese website updates this week with more news!